When you are dealing with spider or varicose veins, it can be extremely frustrating. You can take good care of yourself, watch the amount of sodium in your diet and exercise daily. However, all of those efforts may not be enough to stave off problems with your veins. Your primary care doctor may recommend compression stockings to help you deal with these troublesome veins, but stockings won’t make them go away. The truth of the matter is that once you have spider or varicose veins, they will not go away. Over time, they are likely to worsen to the point that your legs feel heavy, ache or itch all of the time and drag you down. Before you let things go too far, our IAC accredited vein center can help you to find a solution for your problem veins. Why is IAC Accreditation Important? IAC accreditation is through the Intersocial Accreditation Commission. The commission sets the bar high for vascular care centers, setting standards that must be met to ensure that you will have quality care. 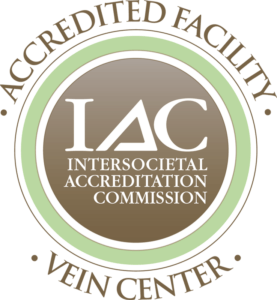 You’ll know that you are in good hands if the vein center has been carefully evaluated and has earned IAC accreditation. At Miami Vein Center, you can have peace of mind concerning the dedication of the staff since accreditation has been a priority. It means that you are our top priority. Our IAC accredited vein center has highly trained staff members and the necessary resources to give you the care that you need. You’ll be able to take advantage of a facility that can provide you with everything you need for vein treatment from start to finish. The process will begin with an evaluation of your veins. If you have varicose veins, the valves are not working properly. As blood travels through your body and makes its way on the return journey to the heart, the valves in your veins are supposed to close. In varicose veins, the valves don’t close after the blood passes through. Some flows backward and pools in your vein. As the blood continues to accumulate, the vein bulges. At our IAC accredited vein center, our team will determine the best course of action for you in order to eliminate your problematic veins. In time, you will be able to enjoy legs that are no longer marred by blue lines. If you are ready to say goodbye to your spider or varicose veins, make an appointment at Miami Vein Center in order to explore your options. Dr. Almeida can examine your legs, discuss your health history and allow you to explore your options. As you review all of the alternatives for vein treatment, you can ask questions and make sure that you are prepared for the journey ahead. It’s time to finally eliminate your varicose veins before they get any worse. Our IAC accredited vein center in Miami can lead the way. Contact us today to schedule your consultation.